The Vancouver Southsiders are the oldest organized supporters group in Canada. We are committed to being loud and proud supporters of Vancouver Whitecaps FC. Founded in 1999, the Vancouver Southsiders were originally a small group of strangers drawn together by their love of the Vancouver 86ers, as the Whitecaps were then known. The group established themselves on the south bleachers of Swangard Stadium, conveniently near both the beer garden and (in the second half, anyways) the opposition goaltender. The Southside encompasses a large chunk of the southeast corner (sections 249-254) of BC Place stadium. The heart of the Southside and the loudest part of the stadium is our general admission section in 252-253. Despite most of our members being concentrated near the GA section, many of our members choose to sit elsewhere. We are open to fans of any age, asking only that if you choose to be a Vancouver Southsider, you do your best to support the Whitecaps on the field. The Southsiders encourage everyone to stand and sing for the entire match, to encourage the home side and make life difficult for the opposition. On most match days, the Southsiders get started well before kickoff. Our home pub is Library Square Public House (300 W Georgia St). 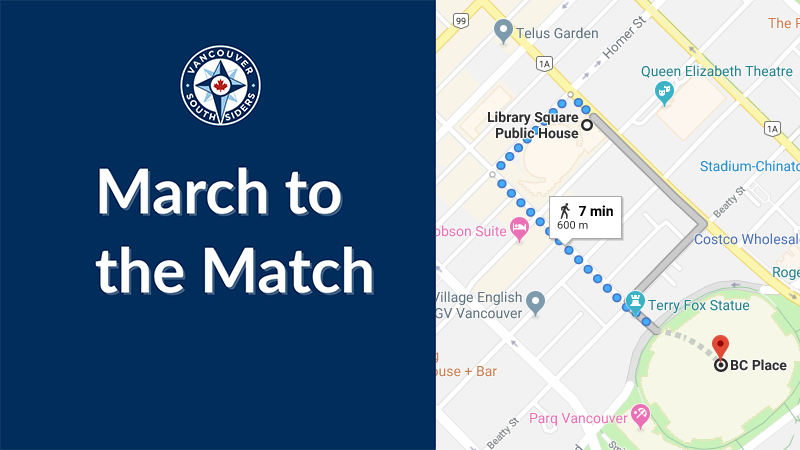 After the pre-game beverages are consumed, the Southsiders and their fellow Whitecaps supporters will gather outside and walk to the stadium by the hundreds. The route of the Vancouver Southsiders March to the Match is shown below, departing from Georgia and Homer, proceeding down Homer to Robson, then onwards towards BC Place.